1. Pick A John Muir Show or Customized Performance for your venue. Each production has at least an hour and a half of material, and is most often presented as a two-act show, requiring an intermission. However, they are also presented in an hour length format or less, and are frequently tailored to meet specific needs of theme and/or time. Conventions, banquets, outdoor shows and schools often have schedules requiring less than an hour for presentation, and all of these shows are easily adaptable. In addition to the performance, the actor can sometimes offer one of several workshop/lecture sessions, or other events. 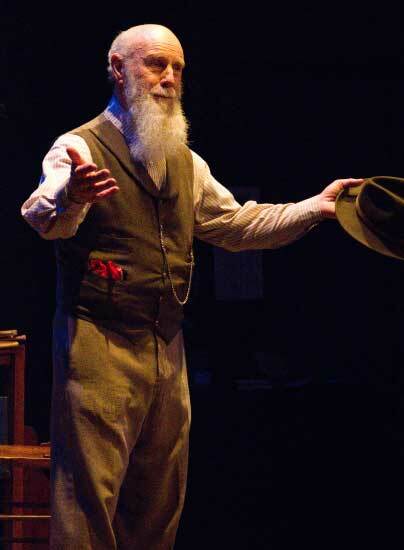 A Stroll with John Muir, in nearly any outdoor environment, is one of the more popular of these, in which “Muir” interacts with those participating, telling stories and answering questions in character. Acting For The Stage, The Creation of a One-Person Stage Show, and Story-telling are other possibilities. Lee also offers a lecture on The Performing Arts and the Environment. Lee can also adapt material from the various productions to present “Muir’s” views on current issues or to emphasize a particular theme. All technical needs for the various productions have been deliberately simplified, and in many cases nothing is required save that the performer be seen and heard. The requirements for full technical productions are described below in the Things Technical section. We enjoy our work, and think it important. Consequently, every request for a presentation will be met with enthusiasm, and a real effort to make it work. For the Muir presentations in particular, the fee is always negotiable, dependent on such factors as Lee’s schedule, size and make-up of the potential audience, and the primary purpose of the presentation (fundraising, entertainment, rally, etc.). We recognize that elementary schools, smaller parks, less affluent communities, and many wilderness and environmental organizations sometimes cannot meet our usual fees. Still, we can often schedule a performance when in the ‘neighborhood.’ We have in the past exchanged our programs for a service, a product, a vacation opportunity, a river trip, etc. We’ll often do a school presentation as well as a community evening event, or find a second venue of some kind close by, to help offset some of the cost. And sometimes a percentage of the gate receipts is a reasonable approach. There’s usually a way to do it, and we pledge our best effort. These expenses are usually calculated from Yosemite, CA for the Stetsons, and the nearest airport is Fresno, CA. For Earll Kingston, these expenses are calculated from Berkeley, CA. For Alan Sutterfield, expenses are calculated from Santa Maria, CA. While touring, these expenses can sometimes be significantly reduced by sharing the costs with a number of host organizations. A motel or hotel as close to the performance as possible is generally preferred. A good deal of publicity material can be generated from what can be found on these web pages, but additional publicity photographs, news articles, poster and program samples can be provided by Lee Stetson. Please email or call Lee Stetson, 209-742-7838 (after 10:00AM Pacific Coast Time) for additional information or for setting a date for a presentation. All of these productions are designed to be produced with a minimum of technical hassle. And while the major performances are designed to be an hour and a half in length, (with intermission), they are frequently presented as shorter versions, from 20 minutes to an hour or so. The playing area for any of the productions needs to be only 20 feet deep and 15 feet wide. Smaller areas may be made to work. A thrust stage is preferred, but any configuration will work well. All of the shows can be done outdoors as well. None of the stage sets require walls, but each, excepting “The Tramp and the Roughrider”, requires a few furniture pieces to suggest the environment. And if the presentation is to be done in one act, without an intermission, and no longer than an hour or so, then only a few of the furniture pieces may be required. A list of furniture for each production will be found below. The background is best black or neutral. Lighting should simply be focused on the playing area, with as little “spill” as possible. The operation of the lights requires no special cues, though it should allow for a simple fading up at the beginning and fading down at the end of each act. Though not always necessary for less than two-act productions, the actor will bring pre-show music for audience enjoyment, for which a good sound system (tape deck, amplifier, speakers) is required. If the auditorium is large, has poor acoustics, or if the show is presented outdoors, a remote (lapel) mike is required for each actor. These are brought to the production by the actor. All of the productions in their full length, two-act versions require some turn-of-the-century furniture. Other versions may require some but not all of the furniture indicated. Conversation With A Tramp and John Muir Among the Animals: A fireplace with mantle (preferred) or a wood stove, a rocking chair and low footstool for it, a large desk and a chair to match, a coat rack, a wastebasket, and two dozen or so old books. If a wood stove were provided instead of a fireplace, another small table would be needed. Not necessary, but helpful in dressing the set, would be plants, large and small, a large throw rug, an old typewriter, and such things as a naturalist would have in his study; pine cones, fossils, rocks, etc. The Spirit of John Muir can use the identical set above, but only a stool (chair high level) is absolutely necessary. Having a lot of plant life about is a good touch. Each performance requires at least one competent technician, familiar with the auditorium’s sound and lighting facilities, to help set up, run the lights, and strike the set. All of the technical needs should be in place before the performer arrives, and at least two hours before curtain, the performer and the technician will set sound and light levels. All of the furniture should be in the center of the playing area when the performer arrives for sound and light check. That’s it! We truly appreciate your interest and hope to bring one of our productions to your community or organization one day soon.